A collection of information about audiobook projects, software projects, software development resources, and obscure software. Information about other things, including old electrical hardware, is also available. In 2010, I designed and produced a custom-labeled cross-platform CD-ROM that contained four audiobooks from the LibriVox project. The audiobooks were in the form of Ogg Vorbis audio files. (The Ogg Vorbis audio format is designed to be freely usable and is used as a primary audio format on Wikipedia among other things.) Multiple copies of this disc were produced and made available to others. The audiobooks were of the L. Frank Baum books The Marvelous Land of Oz (published in 1904), Ozma of Oz (published in 1907), The Magic of Oz (published in 1919), and Glinda of Oz (published in 1920.) A number of accompanying HTML pages and period illustrations were included on the disc. 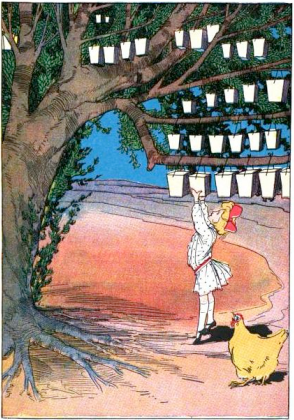 (For example, there was this illustration from Ozma of Oz that shows Dorothy picking a lunch box from a tree.) The CD-ROM also included copies of the Mozilla Firefox Web browser in order to facilitate the playback of Ogg Vorbis audio. The audio playback was implemented via HTML5 support for embedded audio along with the Cortado Java applet as a fallback. Later on, I produced a subsequent disc that had a similar design but with a different selection of audiobooks, namely the L. Frank Baum books The Wonderful Wizard of Oz (published in 1900), The Emerald City of Oz (published in 1910), The Patchwork Girl of Oz (published in 1913), and Little Wizard Stories of Oz (published in 1913.) The audiobook of The Wonderful Wizard of Oz had been recorded in the form of a dramatic reading with multiple character parts by the LibriVox project. As with the previous disc, this CD-ROM was made available to others. Some of the content from the Audiobooks of Oz CD-ROM discs is available for download in the form of archive files. Note that the content included in the archives consists mostly of images (including period illustrations) and HTML files; the archives do not contain all of the software and audio files that were included on the Audiobooks of Oz CD-ROM discs. Also, the exact content of the Audiobooks of Oz CD-ROM discs has changed over time. If you are located outside the USA, please check copyright laws before downloading these archives. A number of software projects that I have publicly released at one time or another are described below. To unpack the contents of downloaded archive files, the StuffIt Expander utility or the MacZip utility may be useful. In the mid 1990s, I released this game for the MacOS platform. The game had black-and-white graphics and was produced using the Microsoft QuickBASIC software. In this two-player board game, there were twelve removable counters, and each player removed one or two of the counters per turn, in a manner similar to the Nim game. (The CounterPoison game also featured a "poison" counter, and the player left with only this counter would lose the game.) In addition to the ability for two persons to play against each other, the game supported a computer opponent that could be configured to play in one of three modes. In February 2011, I released this game for the MacOS platform. 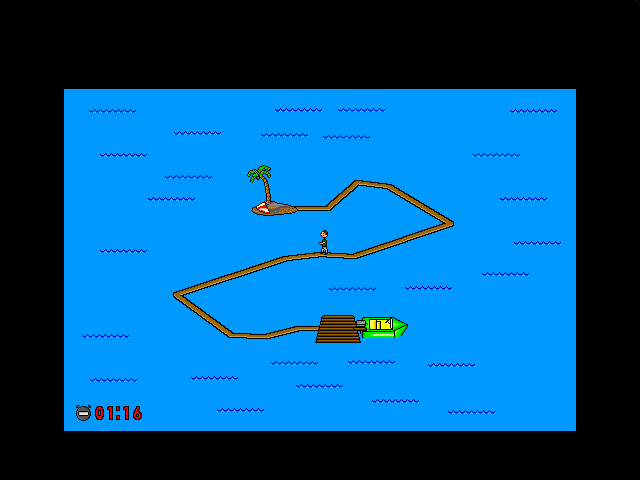 In the RetroShark game, the character of Hiram ("Hee-ram") Hero must be guided along a wooden causeway to escape from a deserted island. The catch is the shark-infested water around the causeway, which must be avoided at all costs. The game featured digitized audio, color graphics, mouse control, and the ability to adjust the causeway layout, among other things. For each of the game's three difficulty levels, the player could choose to use a built-in causeway layout or to randomly generate a new causeway layout for the chosen difficulty level. System Requirements: This game is designed for the classic MacOS platform (pre-OSX) and requires a monitor that is capable of at least 256 colors and/or grays. (Among other things, the development of the RetroShark game started before the arrival of the Mac OSX platform.) Under Mac OSX, the game should run if the Classic Environment is available; however, character movement in the game may be less responsive than it would be otherwise. Intel-based Macintosh systems are not supported. Some of the free/open-source software projects to which I have contributed are listed below. System Requirements: A version of the Mac OSX platform from 10.4 through 10.5.8 is recommended. Later versions of the Mac OSX platform may not work with the Encrypted Folders software. The GNOME Robots computer game is available on various Linux distributions among other places. For this game, I produced a set of four new graphical themes. In the GNOME Robots game, the player must avoid a group of enemy robots (or other hazards) that move towards the player with every step. The new themes feature hazards in the form of anthills, water spills, stormclouds, and toasters. These third-party articles and other resources may be of particular interest to individual software developers. An interesting philosophy wherein software is permissibly licensed for the sake of allowing control to users and user communities. The tale of the Star Wars Quake game modification illustrates certain pitfalls to be avoided with collaboratively developed software projects. A resource editor for the Mac OSX platform. Prerecorded sound effects can be useful for entertainment software projects. SoundJay.com is another source of reusable sound effects. An interview with software developer John Calhoun that was done by Chris Klimas of the Crunchable.net site. A public domain font from Thatcher Ulrich. Though new software comes out all the time, not all software remains common or well known after time has passed, and sometimes software titles come from unexpected locations. This site section is a change from coverage of recent and well-known software. Tom Owad of Applefritter talks about looking for files in old (and sometimes forgotten) libraries on the America Online (AOL) service. Information about the VG Pocket Max video gaming system, including commentary and information about some of the included games. A collection of information about more than ninety software titles (mostly for the Apple Macintosh classic OS) that seem to have fallen into obscurity. A variety of third party sites and articles which may be of interest. An article about the difficulty of applying "truth in advertising" to political ads in the US. A powerful metasearch engine with a privacy emphasis. From Maker Media, Make: magazine covers do-it-yourself projects and how-to articles with an emphasis towards technology enthusiasts. A book about utilizing the important and yet often unclear "fair use" principle of copyright in different situations. Excerpts are available on Techdirt. For US elections, VerifiedVoting.org supports voting methods that are publicly verifiable and which are reliable. This web page is copyright © 2010-2018 by Richard Green. The icon and screenshots of the CounterPoison game and the RetroShark game are copyrighted by Richard Green. All rights reserved. Unauthorized reproduction is prohibited. All trademarks are the property of their respective owners. To contact the webmaster, please use the contact form or send e-mail to richard at thedoorintomorning dot com. If you are interested in encrypted e-mail messaging (PGP/GnuPG), please inform the webmaster. This page was last updated on September 21, 2018. 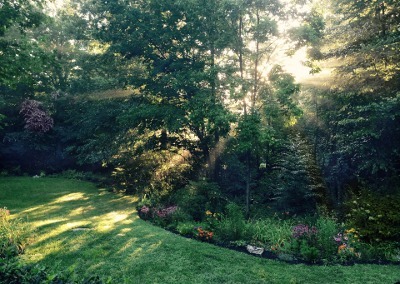 The photo of the garden is derived from an existing photo that was taken by amarcotty on Pixabay and which was placed in the public domain. The image of Dorothy picking a lunch box is derived from an illustration in an edition of the book Ozma of Oz, on page 41. This edition of the book was found on Google Books. The book is out of copyright in the USA; foreign copyrights may apply. The GNOME Robots game is licensed under version 2 (or, at your option, any later version) of the GNU General Public License. The anthills, spills, stormclouds, and toasters themes for the GNOME Robots game are copyright © 2010 by Richard Green and are licensed under version 3 (or, at your option, any later version) of the GNU General Public License.